This is a bit of a PSA to all interested indie writers, bloggers, and other internet types out there. The usual frivolity will return shortly. I recently tore through David Gaughran's Let's Get Visible: How to Get Noticed and Sell More Books in a single session. It's a fantastic resource for any indie author; I highly recommend it. One of the things that David mentioned at the end was that one could easily make an Amazon affiliate link by adding their Associates ID to the end of a product link. Let me back up: I write in Scrivener. For the longest time, I thought that affiliate links involved cutting and pasting HTML code into blog posts or documents, largely because whenever you click the "Link to This Page" button in the Associates toolbar, all it gives you is awful, horrible, no good HTML code! It's really a pain to insert said code into blog posts, and, as far as I can tell from my intermediate-level knowledge of Scrivener, impossible to do so in Literature and Latte's otherwise sterling program. It's also entirely possible that I'm just an idiot when it comes to HTML/programming (which is absolutely true), and everyone already knows this, but I sure didn't, so I thought folks in a similar situation might enjoy a handy little how-to guide. When David's book kindly alerted me to the fact that my days of cutting and pasting HTML might be over, I had to investigate. 1. Get an Amazon Associates Account. Join the program HERE. It might take a few days for Amazon to approve your account. 2. Log in to Associates Central. 3. Find Your Tracking ID in the Upper Left-Hand Corner of the Screen. It should be a combination of letters and numbers with a dash in the middle. 4. Copy this Tracking ID. Preferably to a word processor or notepad, though I suppose you can also do it by hand. 6. Find the product you want to link to on Amazon. 7. Under the boxes on the right side of the page, there will be four or so links: "Share, e-mail envelope, facebook, twitter, pinterest." Okay, I guess that's technically five, but that doesn't matter. 8. Click the e-mail envelope. Amazon will give you a Permalink, shortened to "amzn.com" with the ASIN. 9. Copy the Permalink Address and paste it as the link in whatever you're linking to, making sure to add a backslash at the end. 11. Run the New Link through Amazon's Link Checker to make sure that it works. Voila! An easy Amazon Affiliate Link without html code. Embed this in your Scrivener files and websites quickly, easily, and painlessly to start earning an extra 4-6% from Amazon, all for directing traffic to their site. Not bad, huh? Questions? Ask away in the comments. Hope this helps! D.J. Gelner is a fiction and freelance writer from St. Louis, Missouri. Check out his books, available at his Amazon Author Page and on Nook, iBooks, and Kobo. Follow him on twitter (@djgelner) or facebook (here). 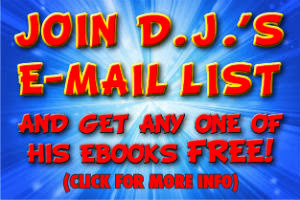 E-mail him at djgelbooks@gmail.com. Thank you! This is exactly the information I needed. I just signed up as an Amazon affiliate, and nowhere on their website could I find straightforward instructions for adding the affiliate tag to an existing link. Now this makes sense! Amazon's ridiculously complicated code is baffling. Thanks! No problem, Deborah--glad I could help! Thanks Gretchen--glad you found it useful! See the reply below--hope it helps! 1) Go to the product page you want. 2) Find the ASIN. It should be below the product description and start with a "B"
4) Type out "http://www.amzn.com/[COPY THE ASIN HERE]/?tag=[YOUR TRACKING ID]"
a) completely close your browser (to the "apple-Q" level if on a Mac), then re-open it. c) if that doesn't work, use a different browser. I use it without a problem on Firefox. Ironically enough, my state recently passed a law that caused Amazon to shut down all affiliates in my state, so I can't benefit from it any longer, but I still have my tracking ID, and the link-checker reads it as valid, so it should still work. Hope this helps! Thank you so much! This worked for my Word documents too. This works to keep your link profile diverse and natural looking because you have to think that if someone was linking to your site from their site, they likely wouldn't use the keyword you're targeting on that page when pointing to your site.